President Lungu said Zambia would greatly benefit if the diplomatic community enhances their efforts in encouraging more trade and investments between their countries and Zambia. The president said Zambia is keen to diversifying the economy from copper mining dependency to agriculture in line with the country’s 7NDP and investments from oversees will help promote diversification, value addition and job creation. 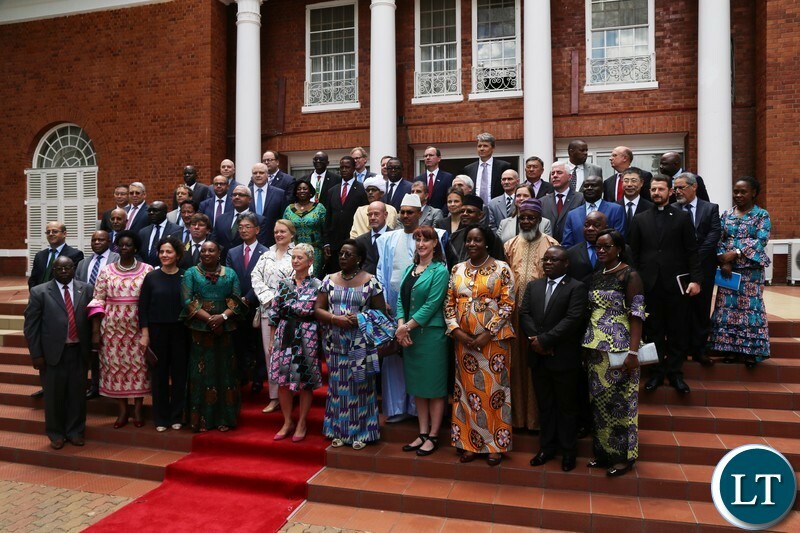 President Lungu said this when he met diplomats accredited to Zambia as well as international development cooperation and aid agencies during the annual greeting of the diplomatic corps at State House in Lusaka. The Head of State said Zambia’s economy performed favourably in 2018 when it registered a 4 per cent growth with a relatively stable exchange rate and single digit inflation. The president attributed the sound economic performance and growth to favourable copper prices for the increased copper production which exceeded 800,000 metric tonnes in 2018 compared to 786,000 in 2017. He said this was supported by positive performance in the manufacturing, construction, tourism sectors and the stable electricity generation and supply. President Lungu said government will continue to support private sector development by responding to the needs of industry in order to spur private sector led growth and industrialization. The president who described Zambia’s 2018 international engagements as successful said the country values the bilateral, regional and multilateral relations it has with all countries and organisations represented in Zambia as they play a significant role in the country’s socio-economic development. President Lungu thanked the donor community for providing technical and financial support towards the completion of developmental projects that are benefiting millions of Zambians. He expressed optimism that the soon to be launched Zambia Economic Diplomacy Forum will help facilitate the exchange of ideas and promote networking between government, the diplomatic community and private sector to deepen mutual beneficial interests. President Lungu urged diplomats to facilitate for their countries participation in the provincial economic expositions government has introduced to showcase the existing potential aimed at wooing investments, tourism and creating jobs and wealth in the various regions across the country. He said Luapula, Central and Northern provinces have held expositions and urged the diplomats to facilitate their countries participation at the planned investment forums by the other remaining seven provinces. President Lungu bemoaned the continued impact of climate change on the globe and pledged commitment to the United Nations Framework Convention on Climate Change (UNFCCC) Paris agreement which he said has been integrated in the national policy on climate change. And he is doing a poor job in marketing Zambia. Sometimes you cant help but feel sorry for Lungu,the job is too big for him,he is talking about diversifying the economy whilst farmers remain unpaid for last year’s produce as though the low price offerred by FRA was not bad enough,FISP has gone haywire under his leadership. He is talking about marketing the country oblivious of the damage his style of leaderhip is causing,cadres are a law unto themselves,crime is spiralling out of control because of the hunger he has caused….how sad..
Loool self delusion ,Bwana Lungu these fine diplomats 1st loyalty is to their respective countries and they’ll market their countries over Zambia . Lungu so who is gonna market a country of giant potholes,stinky public markets , flooded streets ,pit latrines in much of Lusaka ,a rotten UTH ,stone age classrooms in rural areas and a country of few flights by int’l airlines? You can’t even keep Lusaka CDB clean. Don`t forget corruption, theft of public resources with impunity and over priced projects that are there to benefit the political elite. When and how can they market the country, they are always drunk and wake up with hangover? Yaba, My Presido ha ha ha ha. It is not their job to market Zambia, they are marketing their own countries, ask your own PF cadre diplomats to do that for you; unfortunately they are of so low calibre they are drinking and womanising in Embassies abroad. Marketing violence is a bad product and toxic, who wants be associated with it.